I know, I know, it’s taken me forever to get this up! Hopefully, this conclusion to my exploration of the sushi and wine experience makes up for trying your patience. I promised charts. I promised science. I promised that you’d be able to comfortably pick out what wine you want for the experience you want when having sushi. Ladies and Gentlemen, I deliver all of those things in this riveting end point to your wine and sushi voyage. For the very impatient (aka lazy bums, slackers, non-geeks), please scroll to the chart at the bottom to get the answers without having to learn. In Part 1, we did a review of the existing “literature”. By that, I mean we Googled the heck out of pairing wine with sushi and came up with a whole lot of nothing useable. Preferences were listed aplenty, but no guides existed to help you in the sushi restaurant. When a flavor component of the food is similar to that in the wine, the experience of that flavor is enhanced. This is called flavor matching. 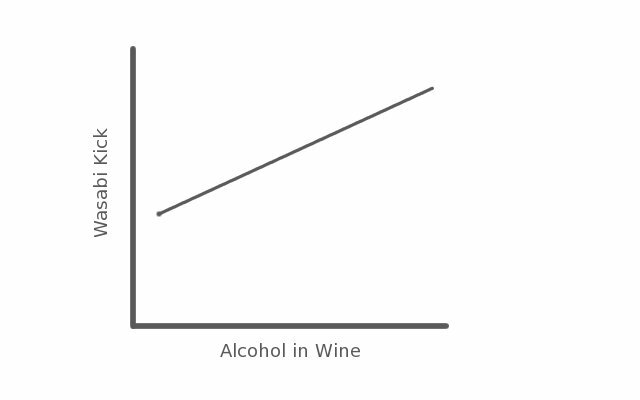 The perception of alcohol will increase when paired with sweet, umami-tasting or spicy foods. The perception of spiciness will decrease when paired to a wine with more acidity. Tannins will noticeably diminish when they encounter salt (soy sauce), citric acid (lemon juice) or vinegar (pickled ginger). 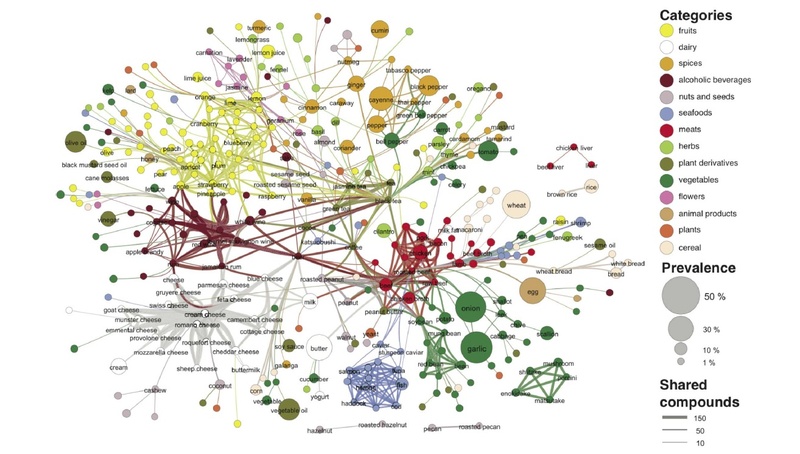 In doing some more research on flavor components, I came across a fascinating article in Nature entitled Flavor Network and the Principles of Food Pairing. When you mix wine with food, it’s really an extension of the existing ingredients that are already in the dish. We have our preferences as to which herbs and spices work in which dishes, so we should have our preferences as to which wines work with which dishes too. In the article they broke down all of the components of food down to the compound level. You see, it’s the combination of certain compounds that we interpret as flavor and aroma. Then they ran through various recipe sites on-line and compared which components always showed up together and which ones did not. The most interesting outcome of this study was that they found in Western cooking, we generally like to put together ingredients that share compounds. In Eastern cooking, we generally like to put together ingredients that do not share compounds. Now think back to the first interaction I listed. If two items match up on flavor/aroma compounds, then that flavor/aroma will be enhanced. If two items don’t match up on the compounds, then nothing is really enhanced, but things are made a bit more complex. Trouble wrapping your head around that one? Thankfully, the authors of the paper came up with an excellent chart to show which ingredients share components (closer together) and which ones have differing components (farther away). Definitely click on it to get the larger view. To associate this with our sushi and wine pairing, this means that if we have a wine that shares a lot of compounds with the components in the sushi, we are going to get an enhancement of that particular flavor or aroma. The wines that do this are going to typically be whites since they carry a lot of the green, tropical fruit, floral, and minerally components. If we have a wine that diverges from the compounds of the sushi components, we are going get a more complex sensation of taste. This will happen with the vast majority of reds with their more earthy, red fruit, and black fruit components. I generally like to think of this concept in terms of sound waves because they do the same thing. A sound wave is enhanced if the same wave gets overlaid on to it and the sound wave is neutralized if the exact opposite wave is laid on top of it. [As a side note, the latter method is essentially how noise cancellation works.] [As a side note to the side note, I think the idea of creating flavor or aroma component “chords” is something very real and needs to be explored] Therefore, the first decision you have to make is whether you want an enhancement of certain components with your wine and sushi pairing or if you want to add complexity to your experience. Posting the common aroma descriptors of each varietal would make this post a bit lengthy, so I’ve simplified the concept in the chart at the end. The second decision you have to make is how much of a wasabi kick you are looking to get. If you’re eating sushi the “proper” way, you should only have a tiny dab with your bite (if any at all), but some people have been known to take a chunk just to get that brain burn feeling. Again, a reminder that the wasabi you are having is really horseradish, mustard and food coloring and not actual wasabi, but the effect is generally the same. One way to control the amount of kick is to simply control the amount of wasabi you are ingesting at a time. However, one can neutralize some of the effects of the spiciness by taking a swig of wine that has some noticeable acid in it. This is nice for those who are not so daring to swallow a chunk of wasabi outright, but might enjoy the pepperiness that it brings. The exact proportions will differ by person, but it’s certain that if you take a lot of wasabi in at once, no amount of acid will diffuse that shooting burn you’ll get through your brain. It’s the in between area that there is room to play. On the flip side of that, if you have a wine with more pronounced alcohol content, that kick may be heightened depending on your level of sensitivity. The more tolerant taster who doesn’t noticed higher alcohol content in wines as much (as a burning sensation in the back of your throat near the nasal cavity) may be more tolerant of spicy foods to begin with. The more sensitive taster should take note though. For those who like to live on the edge, take something 100 proof alongside a big chunk of wasabi. I’m sure it will be a trip you won’t forget. If anyone wants to create a shot based on that, all I ask is that you send a small portion of the revenue from all of your “I survived….” merchandise my way. Last, we consider the tannin factor. That cotton feeling you get wrapping around your tongue generally with red wines. 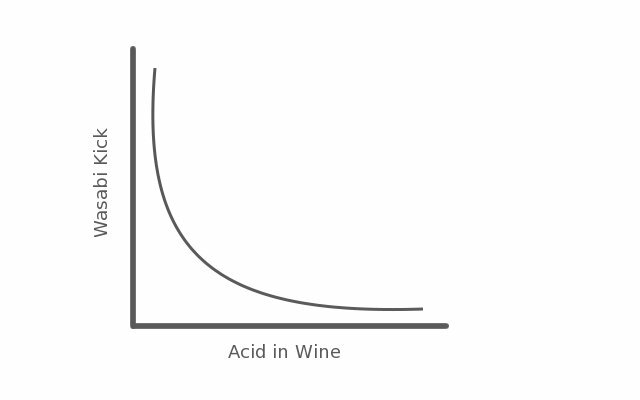 This was a big point of contention on the internet as the red wine purists couldn’t understand why their tannins had disappeared and the rest of the people didn’t want them there in the first place. 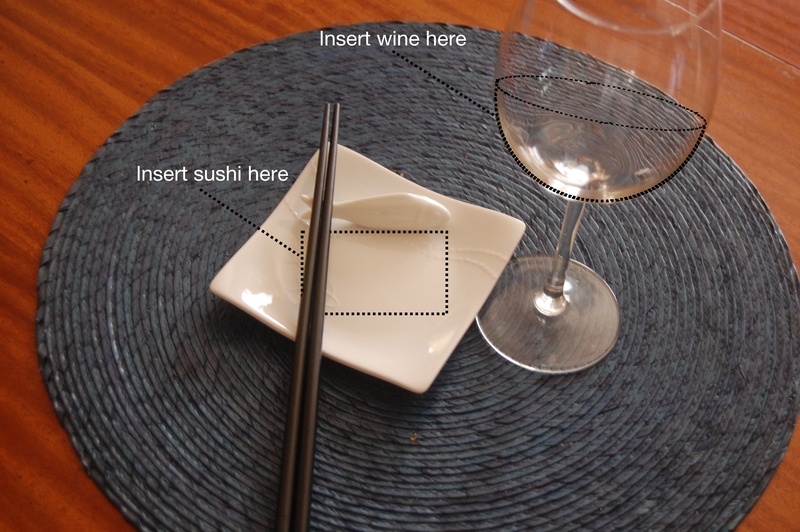 But are we just restricted to white wines or red wines sans tannins when eating sushi? No! You can have the wine you want with the experience you want, but you may need to take steps to get it that way. 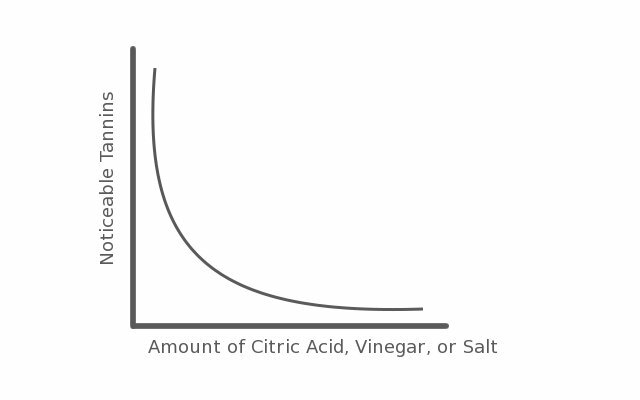 Let’s remember that the sensation of tannin decreases significantly when you add in citric acid, vinegar or salt. We can get citric acid from a lemon slice, vinegar from pickled ginger and salt from soy sauce while we’re eating sushi. Use these as your tools. You want all the tannin goodness your favorite wine can provide? Stay away from dunking your bite of sushi into soy sauce; forgo the slice of pickled ginger in between bites. Your tannins will be there every step of the way. What’s that? You inconsiderately ordered a bottle of tannic red wine without asking the people you are with what they want and they don’t want any tannin at all? Well they’ll be resigned to getting a bit more soy sauce on each bite than they’re used to; having a slice of pickled ginger in between bites; or maybe just squeezing a bit of lemon over everything. The moderates can find their ideal balance somewhere in between with a little trial and error using the tools available. Now, I wouldn’t have gone through all this work without trying these theories out on unknowing participants. That’s not my style. An event was put together with 15 people to verify the effects of these interactions with 4 different wines and an assorted collection of sushi. Was it scientific? Not remotely. 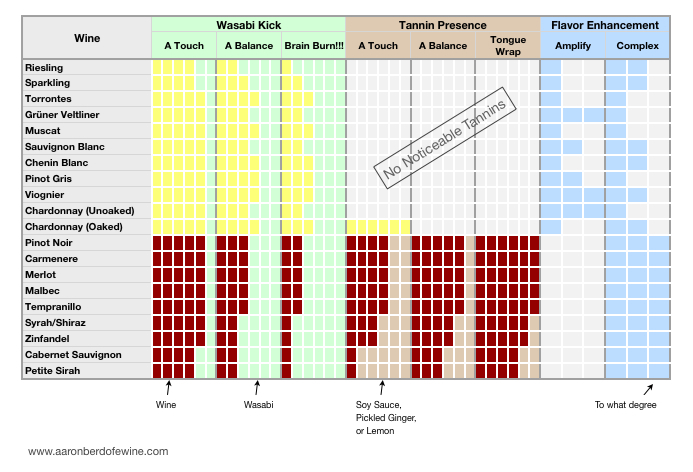 Did it successfully verify that people who just like wine and also like sushi can use this information to identify what wines they like best with sushi? Absolutely. We used all of the common ingredients found in sushi restaurants in Minneapolis and tasted four wines throughout the night: Grüner Veltliner, Viognier, Carmenere, Shiraz. Keeping in mind that the impression my internet searching left me with was that people shied away from reds when eating sushi, it was a fun surprise to discover that with the tools I had given the group, the overall favorite pairing was the Shiraz. The key, as with just about everything, is balance. More importantly, it’s knowing what you are balancing. Three questions need to be asked when you sit down to sushi and you’re deciding what wine you want. How much wasabi kick do I want? How much tannin do I want to be noticeable? Do I want flavor enhancement or flavor complexity? Finally, here is the chart that was given to the willing subjects. The wines listed are all of those available at the various sushi restaurants in Minneapolis and St. Paul. Notice how it guides you toward achieving balance through trade offs. Happy pairing! Halibut, pan-heated then baked with dill, cracked pepper and sea salt. Sided with wasabi sour cream, a red pepper vinaigrette and dill and paprika spiked couscous. To get this out of the way up front, this pairing was amazingly fantastic! But on to other important issues, like what is that thing on the logo? I’m completely vexed by this thing and couldn’t stop staring at it all the way through dinner. An inquiry has been sent to the folks in Austria because this is a “need to know” item. I’ll update the post as soon as I get a response. 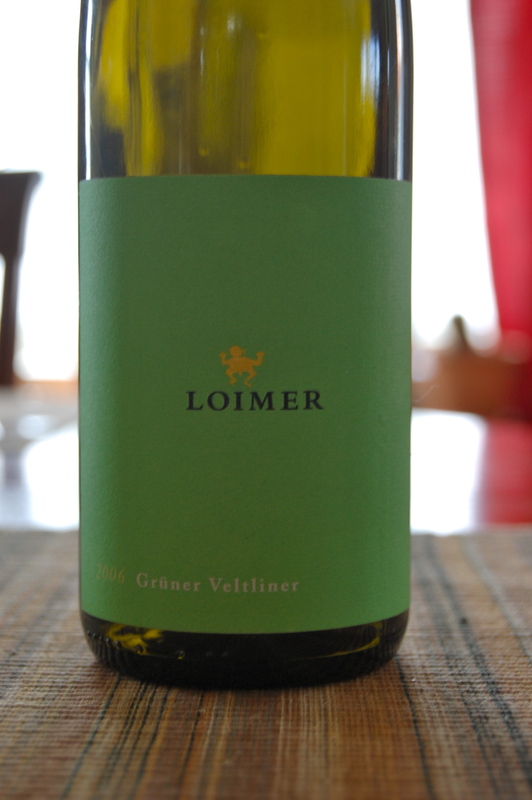 Back to the pairing though: Grüner Veltliner, known as “GruV” over in Austria where it is top dog is one of the few wines I’ve found that work great with spicy asian foods (thai, sushi, etc.). It’d probably work pretty well with some Indian food now that I think of it. However, for this meal the fantastic acid in this wine cut through the spice of the wasabi sour cream (just mix wasabi paste into sour cream and stand back) and the spicy red pepper vinaigrette. The body of the wine perfectly stands up to the dish. With flavors of green apples, lemon peel and some great minerality every bit of this dish was complimented. I even got every element of the dish into my mouth with the wine at the same time to fully appreciate this. A big nod goes to this wine’s wonderful balance. I need to go get another bottle or 6. UPDATE: Straight from Birgit Loimer, that bad boy on the label is in fact a fertility god. Hopefully, they don’t have troubles selling this wine to the people of Alabama like some wines do.